The Haryana Government and the authorities of the local Postgraduate Institute of Medical Sciences (PGIMS) are in a quandary over admissions to postgraduate courses following an apex court order of January 5. The order had upheld the judgement of the Punjab and Haryana High Court quashing the admission of 27 candidates. The ASI team has found a number of dwelling houses with structures and items of daily use, bangles made of copper, terracotta stones and shells, chisel, fish hooks and rings made of copper, blades and multipurpose tools made of chert stones and many other things like beads of semi-precious stones and a lot of pottery items, at Bhirdana village in the district. The Leader of the Opposition in the Haryana Assembly, Mr Bhupinder Singh Hooda, has criticised the law-enforcing machinery for its alleged failure to check shooting incidents on court premises. Two youths were shot while one sustained serious injuries when five assailants opened fire indiscriminately at Norwala village, about 5 km from here, last night. Old-time rivalry between groups is believed to be the cause behind the incident. District Magistrate D. Suresh has promulgated prohibitory orders under Section 144 in Dabwali and Kalanwani towns of the district in view of the municipal committee by-elections in Kalanwali scheduled for January 11 and Dabwali Municipal council election scheduled for January 29. The All-India Federation of SC/ST and Backward Classes has urged the Chief Minister of Haryana to accept their demands by the first week of next month, otherwise it would organise a protest rally. On the first death anniversary of former MLA of Ambala Cantonment, Bhagwan Dass Sehgal, the Bhagwan Dass Memorial Trust honoured five prominent citizens of Ambala for their services in different social fields. Residents of the city should come forward to chalk out a plan to regulate the traffic in the city for which the district police will extend full cooperation. The Deputy Commissioner's residence, which is one of the most important addresses of Ambala , could well have been in the Cantonment area instead of the city had the suggestion made nearly eight decades ago been implemented. Last rites of Constable Rajesh Kumar were performed with full state honours at his native village Dhanana today. These candidates of the Haryana Civil Medical Service (HCMS) had been admitted to various PG courses last year by relaxing the requirement of minimum marks in the entrance test specified by the Medical Council of India (MCI). The apex court order means that these candidates will be reverted to their parent departments, leaving the PGIMS with a shortage of doctors. There will be 27 vacant seats in various courses in mid-session and the authorities concerned have no clear idea of how to fill up these. Open category candidates, who had been denied admissions as the seats had been given to HCMS candidates, were seeking admissions as their legal stand had been upheld by the apex court. Their demand had also been indirectly backed by the PGIMS administration, which has approached the state government for filling up the vacancies. The government, it is learnt, has asked for legal opinion on whether counselling can be initiated again at this stage under the MCI rules. The PGIMS Director has already sent a letter to the state government to allow the 27 HCMS doctors to continue with the institute on deputation to avert a shortage of doctors till the vacancies are filled or alternative arrangements made. Official sources said the schedule fixed by the MCI for admissions as per the Supreme Court directions in an earlier case was the biggest hindrance to fresh admissions to the 27 seats. According to the guidelines, no admissions could be made after the last date fixed for the same under any circumstances. On the other hand the open category candidates allege that the rules are being misinterpreted. They maintain that the new MCI schedule are not applicable on their batch and it will come into effect from the next session. In their representation to the Chief Secretary they have cited examples of Rajasthan, Uttar Pradesh and Maharashtra where such admissions have been made even after the last date prescribed by the MCI for the current session. The ASI team has found a number of dwelling houses with structures and items of daily use, bangles made of copper, terracotta stones and shells, chisel, fish hooks and rings made of copper, blades and multipurpose tools made of chert stones and many other things like beads of semi-precious stones and a lot of pottery items, at Bhirdana village in the district. But the biggest ‘discovery’ of the ASI team is a classic Harappan seal made of soft stone. The ASI had earlier discovered the presence of same townships of the Indus Valley Civilisation at two other places Kunal and Banawali in this district. Briefing about the antiquities found during the excavations, Mr L.S. Rao, Superintending Archeologist, ASI, who is heading the excavation team here, said copper bangles, shell bangles, terracotta bangles and ornaments made of semiprecious stones throw a light on the types of ornaments worn by people of that age. The blades and multipurpose tools found here were made of chert stone, which is found at Sakkhar in Sind (Pakistan). They have also recovered terracotta beads. Animal figures made of terracotta stone have also been found there. Pottery of earthen clay with fine paintings on them has also been found. The seal made of soft stone carries a picture of a bullock-like animal and some other objects engraved on it. He said seals like this had been found almost at all Indus Valley sites. The findings also include a complete township with dwelling houses, streets and 50-metre long and 2.5 to 3 metres wide fortification wall on the western end of the township. A seal of the Harappan era found during excavations at Bhirdana village. In a statement issued here today Mr Hooda said the Gurgaon incident in which certain persons fired on an undertrial, killing a constable in the process, on the court premises yesterday was not an isolated incident. Earlier, antisocial elements had exchanged fire at court premises in Jhajjar for over three hours. Similarly, criminals had shot dead an old woman inside the court complex at Panipat. Mr Hooda said all these incidents showed that there was no fear of the law-enforcing machinery among criminals in the state. He alleged that Chief Minister Om Prakash Chautala had politicised the police by using it to implicate his political opponents in false cases. Two youths were shot while one sustained serious injuries when five assailants opened fire indiscriminately at Norwala village, about 5 km from here, last night. Old-time rivalry between groups is believed to be the cause behind the incident. Sandeep along with his friend Raju visited his sister’s house in Moti Ram Colony of the village last night. The incident took place at around 9.15 pm when after spending a few minutes at the house, the two left for the market to purchase audio cassettes. They had just moved out of the house, when the assailants, who were standing a few meters away, started firing. After firing shots for about 10 minutes, the assailants fled in a Maruti car. Talking to this reporter, a villager said no one dared to move out of his house for a few minutes after the incident because of the fear of being caught in cross-firing. He added that he had learnt that the victims had tried to run away from the scene after seeing the assailants, but as they were trapped in the middle of the road, they had no place to escape. The two died on the spot while one passerby sustained serious injuries and was admitted to the Civil Hospital. The Superintendent of Police, Dr Suman Manjry, said the two youths had been involved in several criminal cases in Bahadurgarh and also some other status. The cause of the murders was old-time rivalry of the youths with some groups in Bahadurgarh. The police was investigating the matter. Police sources said the brother of Raju was also killed last year in January following old rivalry. Thereafter, Raju along with his friends had attacked the persons who were responsible for his brother’s death. Due to the rivalry between the two groups, Raju’s parents had advised him to stay with his sister in Panipat. Raju and Sandeep, who hail from Bahadurgarh, were living in Hari Singh Colony in the city for the past some time. According to the notification, the orders have been enforced till January 12 in Kalanwali and from January 27 to 31 in Dabwali. A meeting in this regard was organised in Ambala Cantonment at Sarwan House in which a steering committee of six members was constituted. The members are Mr Karambir Singh, Mr Kanha Ram, Mr Ram Sokhal, Dr S.S. Sadar, Mr Jioti Prashad and Mr Jogi Ram. Besides, Mr M.L. Sarwan was also included in the committee. Talking to mediapersons at the end of the two-day meeting, the president of the Haryana unit, Mr Karambir Singh said that the main demands of the federation included implementation of the 81st, 82nd and 85th amendments to the Constitution, reservation in promotions in classes 1 and II posts, 27 per cent reservation for backward classes in promotions in all departments, reservation in nomination to the IAS and HCS cadres, reservation in the Army and judiciary and steps to prevent atrocities on Dalits and backward class. It was decided that 21 high-powered committees would also be constituted in which representatives of the various organisation of the SC/BC would be included. The steering committee would meet the Chief Minister, Mr Om Prakash Chautala, to brief him about the demands of the federation. The former Governor of Himachal Pradesh, Mr Suraj Bhan, was the chief guest on this occasion, while the Member of Parliament from Ambala presided over the function. The citizens who were honoured were Dr Jitender Aggarwal, Mr Satyender Khanna, Mrs Pushp Lata, Dr N.C. Jain and Mr J.C. Bali. Mr Bhan said that Bhagwan Dass Sehgal had a long clean political career. He had been MLA from the Jan Sangh. Later he did a lot for the BJP. Mr Kataria said that Sehgal spent his life in simplicity and practised value-based politics. The secretary of the trust, Mr K.L. Sehgal, said that the trust would honours five citizens every year. Residents of the city should come forward to chalk out a plan to regulate the traffic in the city for which the district police will extend full cooperation. This was stated by the district police chief, Ms Mamta Singh, while speaking at a seminar on “Nuisance of Traffic and Noise Pollution” organised by the local unit of the Panchnad Research Institute on the premises of the local Shiv Shakti Blood Bank here on Friday. Representatives of various business, social and doctors’ organisations participated in the seminar. The district police chief and the SDM appreciated the efforts of the institute and said the district administration would take up the traffic and noise regulation problems actively provided the public representatives came forward to initiate an awareness campaign regarding these. Dr Ved Baniwal, chairman of the institute, said a meeting of various business and social organisations had been held on December 15 in which representatives were nominated to take a decision and prepare an action plan to control increasing noise pollution and traffic in the city. He suggested to the administration to provide a telephone number to receive complaints regarding noise pollution and to keep the identity of the complainant secret. Various representatives gave suggestions to regulate the traffic in the busiest market centre of Rori Bazar. Mr Ishwar Chand Singal of the Haryana Vayaparmandal suggested developing this business centre into a model market while Mr Sharwan Gupta suggested banning entry of four-wheelers in the area during certain hours. Till the mid of 1920 there was no earmarked residence for the Deputy Commissioner. About a decade before that, need arose for a permanent accommodation for the Deputy Commissioner and the search for the residence began with gusto. Ultimately, the new Manouli House was zeroed in. However, it was opined that the Deputy Commissioner's residence should be in the Cantonment area instead of the city. The advantage of electric lights and fans was cited as one of the reason for preferring the area. A letter dated January 14, 1926, from the Deputy Commissioner of Ambala to the Commissioner of Ambala division states "I can see no reason why the Deputy Commissioner should be forced to live in the Civil Lines, particularly as there is no convenience as compared with the Cantonment area in the matter of his accessibility and he is in the Civil Lines entirely cut off from the society." In my opinion, it would be much more satisfactory if the Deputy Commissioner was allowed to take a house in the Cantonment area. "As you know, there is great scarcity of water in the Civil Lines and there is no prospect of any improvement in the supply until a new and expensive scheme has been sanctioned and it would probably be many years before any permanent improvement takes place," the letter states. The letter points out, in the Cantonment the Deputy Commissioner would have the advantage of electric lights and fans. The Civil Lines situated at least a mile and a half from the courts and from the city's railway station whereas if a convenient house was obtained in the Cantonment area, the distance from there to the courts will not be more than 3 miles. Now that cars and telephones are common, I can see no reason why the Deputy Commissioner should be forced to live in the Civil Lines. On February 15, 1926, Sardar Umrao Singh of Manouli wrote to the Deputy Commissioner "In reply to your DO letter dated the 8th , I beg to say that I have no objection to lease or sell the new Manouli House in the Civil Lines, Ambala City, if a house is urgently required by the Government for the residence of the Deputy Commissioner, Ambala." However, Sardar Umrao Singh's wife Sardarni Gurdial Kaur in a letter to the then Deputy Commissioner ,Ambala, Mr C.W. Jacob, objected to the selling of Manouli House for the Deputy commissioner's residence. "I have heard, though I hesitate to believe, that my husband Sardar Umrao Singh is negotiating with you, with a view to sell new Manouli House to the Government. I am told that he actually took you round to see the house for this purpose." "I respectfully beg to point out that I am in possession of the house. Though my claim regarding the house has been dismissed by the Senior Subordinate Judge, Ambala, the appeal is pending before the High Court. I cannot live forever with my parents and I must have a house for myself and my children to live in Ambala," the letter by Sardarni Gurdial Kaur, who was then in the care of her father Sardar Prem Singh Sahib `Premniketan' Raisini , Delhi, states. 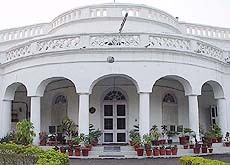 Interestingly, since the beginning of the last century efforts were on for the Deputy Commissioner's residence. A communique states that in 1912, the Secretary to the Government of Punjab, suggested to the Superintending Engineer, 2nd Circle, that provision of a house be made for the Deputy Commissioner who was then occupying Garhi House (now owned by Sardar Umrao Singh of Manauli). "Mr Clarke, then Deputy Commissioner, had the house valued by the Executive Engineer, Ambala, and the figure arrived at was Rs 20,402. In 1918, Mr Abbott, Deputy Commissioner, again submitted a proposal for purchasing the house from the Manouli Estate and the proposal was sanctioned at a cost of Rs 20,960 but the Sardar in his letter dated November 6, 1919, protested against the sale and Lt Col Elliott, Commissioner, did not recommend its acquisition. He suggested that a new house could be built for less money," the communique observes. Finally, on May 6, 1926, a missive from Mr H.Fyson Esquire, Deputy Commissioner, to the Chief Secretary to the Government of Punjab, states "the difficult question of a house for the Deputy Commissioner in the Civil Lines has been settled and I trust that sanction will be obtained and payment made promptly. The repairs will amount to Rs 6000 as already estimated and thus the total rent will not be too high. The cost of the transfer and registration was not discussed with the Sardar and I think these should be paid by the Government." He yesterday took an undertrial from the Bhiwani jail to the Gurgaon court. As he came out of the court, four members of a rival gang opened fire on the undertrial. Rajesh suffered several shots while shielding the undertrial. Later the four assailants were killed.